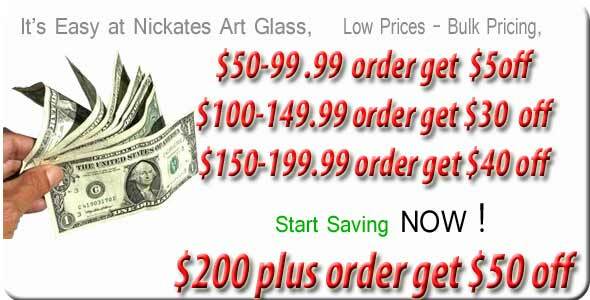 Wissmach stained glass supply- Distributed by Nickates Stained Glass Supplies Inc. The History of Wissmach Glass Company A century ago, on October 13, 1904 the Ohio Valley Glass Company was founded by Paul Wissmach. The company originally manufactured raised glass letters, wire glass and tubing. But Mr. Wissmach had a dream to create beautiful colored rolled sheet glass to inspire stained glass work, today his dream has been built into the manufacturer of the largest variety of colored rolled sheet glass in the world. The year 1910 marked an important date in the company's history as it changed its name to The Paul Wissmach Glass Company, Inc. Mr. Wissmach's dream had finally been realized. Wissmach Glass has not been without its share of hardships. A fire in 1927 completely destroyed vital manufacturing and warehouse facilities. The fire turned out to be a blessing-in-disguise as the company quickly recovered with new and larger buildings. The increased factory area led the company to expand its interest into the field of manufacturing raised white opal letters. The letters were widely used in electrical signs of which theater marquee sales made up the largest volume. The glass letter market eventually gave way to plastics. During the same period of the late 1920's and 1930's, Wissmach Glass continued to manufacture patterned wire glass and also introduced its line of Neo-Flash - the only rolled flashed glass in the country. Neo-Flash was designed and widely-used in the lighting field. Both Neo-Flash and wire glass were dropped from the line in the early 1960's as company officials decided to concentrate on producing the finest colored rolled sheet glass. Today, over 13,000 square feet of glass is produced in Wissmach's manufacturing facility each day. On average, eight to ten different color runs of glass are made daily. Throughout the years, Wissmach Glass has built an inventory that includes over 3,000 colors, tints and patterns. While preserving the many traditional colors and mixes of the past, Wissmach constantly introduces new colors and types of glass to meet the demands of the artists of today and the artists of tomorrow.